Beasts of the Southern Wild from director Benh Zeitlin is a highly visceral film in many regards. From its characters, their questionable actions, the evocative score, and the worthy direction – the movie is vibrant with passion and pronouncement without being pretentious or manipulative. The atmosphere created is akin to that of a fantastic poem, punctuated by the harsh realities that its characters try to avoid, but nonetheless prepare for. The world of the Southern Wild is both rife with magic and tragedy. Six-year-old Hushpuppy (Quvenzhane Wallis) is a strong but quizzical young girl who lives with her father, Wink (Dwight Henry) in a southern Louisiana bayou cut off from the rest of civilization by a levee (thus earning the bayou its name, the “bathtub”). Wink is an ill-tempered man with an equally ill body. As a storm approaches the bathtub, a handful of the devoted community decides to stand their ground against the elements against all odds, and also against the authorities who threaten their way of life (regardless of their intentions). Wallis gives an amazing performance as Hushpuppy. She perfectly portrays the characters strong will, but also her natural fears and curiosities. Henry’s Wink is also a good performance. The character is a divisive one. His treatment of Hushpuppy is cruel, and to many, perhaps inexcusable. But his motivations are pure, even if his methods may not be. 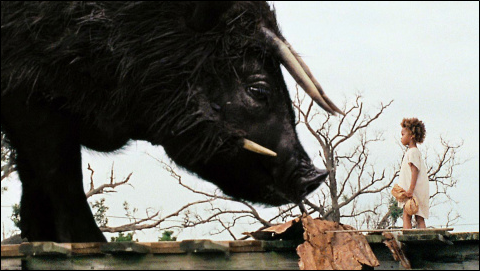 The movie is punctuated by Hushpuppy’s narration, where she exposits her worldview and perception of the events that transpire in her life through it (imaginatively through the physical representation of prehistoric aurochs). Honed by her father to be strong enough to endure the harshness of the bathtub since birth, Hushpuppy’s comprehension of the world and how it truly operates is initially skewed, and the movie is really about her journey, as well as the journey of her fellow bathtub residents, to come to terms with the reality of accepting change, and moving on.